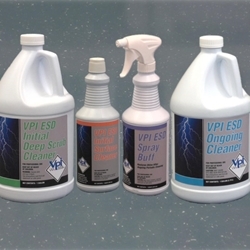 VPI 04101G ESD Initial Deep Scrub Cleaner - Micro Parts & Supplies, Inc. Description: VPI ESD Initial Deep Scrub Cleaner is the first step in the overall VPI ESD Flooring Initial Maintenance System. ESD Initial Deep Scrub Cleaner meets or exceeds green industry standards for floor care products based on its reduced levels of volatile organic compounds, biodegradability, and low toxicity. Used in conjunction with the VPI ESD Initial Deep Scrub Pad (gray in color) it deep cleans, preps, and conditions any new VPI ESD tile floor by thoroughly removing deep down manufacturing residue and ground in installation debris. Deep scrub cleaning, using VPI ESD Initial Deep Scrub Cleaner is required before cleaning the surface of the floor.